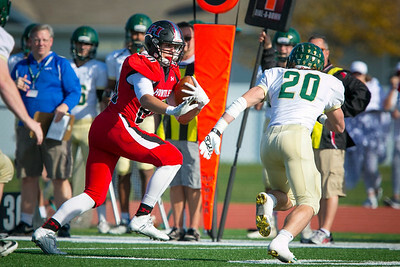 Daryl Quitalig - For Shaw Media Huntley running back Carter Beaudette (34) runs the ball in the third quarter of an IHSA Class 8A second-round playoff football game against Fremd at Huntley High School Saturday, Nov. 5, 2016. Huntley won, 38-30. 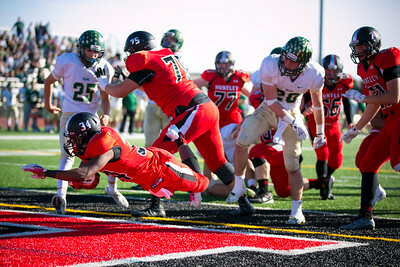 Daryl Quitalig - For Shaw Media Huntley running back Carter Beaudette (34) runs in a 3-yard touchdown in the third quarter of an IHSA Class 8A second-round playoff football game against Fremd at Huntley High School Saturday, Nov. 5, 2016. Huntley won, 38-30. Daryl Quitalig - For Shaw Media Huntley's Andrew Pertzborn (78) celebrates with Carter Beaudette (34) after his 3-yard touchdown in the third quarter of an IHSA Class 8A second-round playoff football game against Fremd at Huntley High School Saturday, Nov. 5, 2016. Huntley won, 38-30. 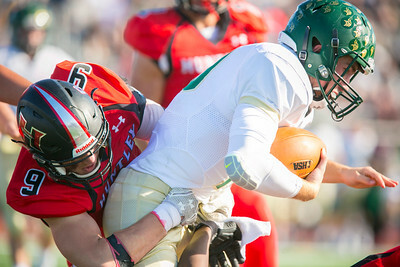 Daryl Quitalig - For Shaw Media Huntley defensive lineman Caleb Jones (9) sacks Fremd quarterback Tom Josten in the second quarter of an IHSA Class 8A second-round playoff football game against Fremd at Huntley High School Saturday, Nov. 5, 2016. Huntley won, 38-30. 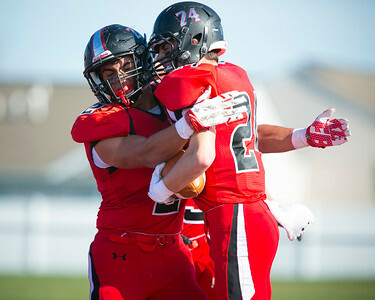 Daryl Quitalig - For Shaw Media Huntley's Tony Bucaro (2) celebrates with Tyler Koss (24) after his touchdown-scoring interception in the first quarter of an IHSA Class 8A second-round playoff football game against Fremd at Huntley High School Saturday, Nov. 5, 2016. Huntley won, 38-30. 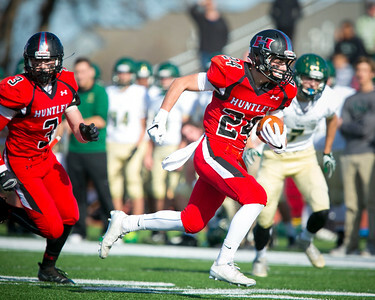 Daryl Quitalig - For Shaw Media Huntley defensive back Tyler Koss (24) runs in a touchdown after an interception in the first quarter of an IHSA Class 8A second-round playoff football game against Fremd at Huntley High School Saturday, Nov. 5, 2016. Huntley won, 38-30. Daryl Quitalig - For Shaw Media Huntley defensiveback Hunter Kowalski (7) and Tyler Szekely (3) bring down Fremd tight end Austin Schwantz (81) in the third quarter of an IHSA Class 8A second-round playoff football game against Fremd at Huntley High School Saturday, Nov. 5, 2016. Huntley won, 38-30. Daryl Quitalig - For Shaw Media Huntley quarterback Eric Mooney (5) passes the ball in the first quarter of an IHSA Class 8A second-round playoff football game against Fremd at Huntley High School Saturday, Nov. 5, 2016. Huntley won, 38-30. Daryl Quitalig - For Shaw Media Huntley wide receiver Jacob Rodgers (80) runs the ball after a reception in the first quarter of an IHSA Class 8A second-round playoff football game against Fremd at Huntley High School Saturday, Nov. 5, 2016. Huntley won, 38-30. 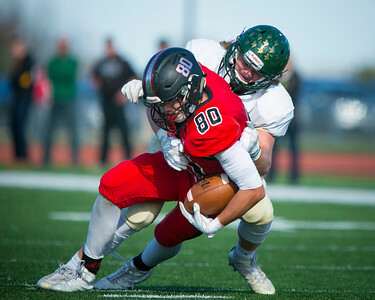 Daryl Quitalig - For Shaw Media Huntley wide receiver Jacob Rodgers (80) is tackled by Fremd linebacker Jimmy Walsh (6)immediately following a reception in the first quarter of an IHSA Class 8A second-round playoff football game against Fremd at Huntley High School Saturday, Nov. 5, 2016. Huntley won, 38-30. Huntley's Andrew Pertzborn (78) celebrates with Carter Beaudette (34) after his 3-yard touchdown in the third quarter of an IHSA Class 8A second-round playoff football game against Fremd at Huntley High School Saturday, Nov. 5, 2016. 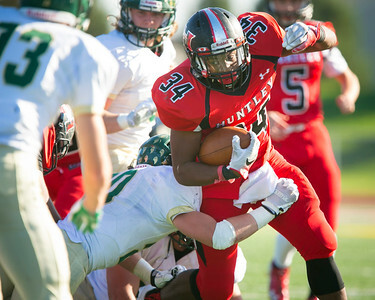 Huntley won, 38-30.